There is a special thrill, isn’t there, in growing something yourself? What is sweeter than that hard earned carrot or the strawberry that you hunt down yourself, peeking under leaves on your hands and knees? I am still suffused with pleasure when I can walk back from the garden with an armful of lettuce (and I am looking forward to lettuce weather — I don’t bother with it in the heat of the summer). I admit that I take some of the garden workhorses a bit for granted; radishes, with their dogged reliability are like loyal friends that are all too easy to under-appreciate, and even home-grown tomatoes can begin to taste simply good and normal by the end of the summer (until you end up face to face with a supermarket tomato, that is). Some things, though, dazzle us just by making an appearance. 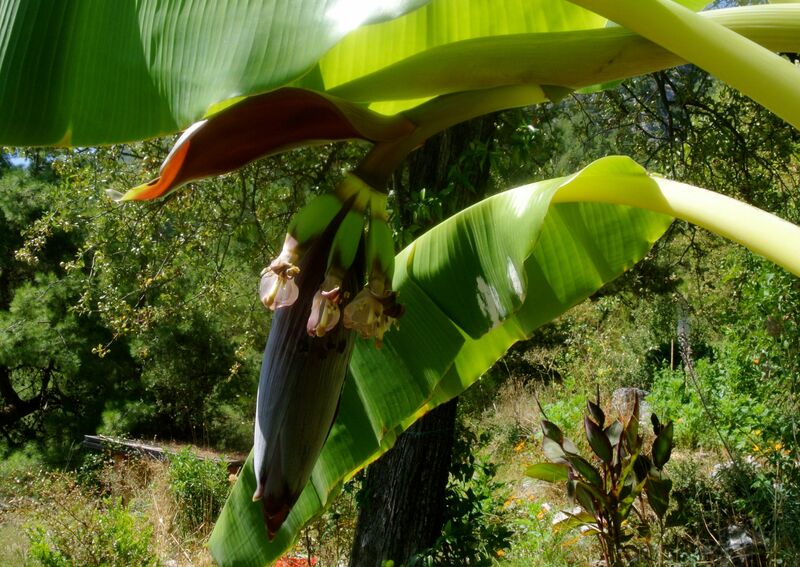 This banana tree is located at the outlet of one of our drainpipes, so it gets plenty of grey water throughout the year. And every winter it dies way back only to re-emerge late in the spring. I saw lots of banana trees groaning under the weight of their fruits growing up, but this meager bunch has us beaming with pride. Good old banana tree. That is too cool! Fingers crossed that they’ll ripen for you! We can always hope! Even so, I smile every time I see them hanging there, all green and full of promise. This is probably obvious somehow, but why won’t you be able to eat the bananas? Also, did you always love gardening/ growing things? I was for years a classic “black thumb.” I had indoor plants and invariably killed them. I had a coleus plant that survived me (named James, but not after my dad) but that was about it. So I am living proof that things can change. I am still not great at looking after indoor plants, though. I think it will probably get too cold for those bananas to ripen — they don’t like cold weather at all. We’ll see. I hope you do manage to grow a little something somewhere. Even a pot of parsley is a nice thing to have on the windowsill. It was lovely, I miss it so much! I had some great teachers (especially in English) and it was just so cozy and sheltered compared to university. Although while I was there I think I also didn’t appreciate it as much as I do now, looking back. You will probably be here by the time we can or cannot eat them! That is exciting to see bananas on your tree! Sometimes, the smallest things can be the most exciting. We were like that when our jujube tree produced its first fruit — our grand total harvest for the year. That was two years ago, and we are buried in them this year. I love getting excited over those firsts. Too bad that lemon was also the last! That looks so tropical…I’m looking a leaves changing color and falling. Oh that’s such a beautiful sight, and one we don’t see in these parts. I’ll be happy if they ripen so I can eat them!